Our home for the week was a beautiful little AirBnB cabin in the woods just outside Helsinki and close to our shoot location. Complete with private sauna and two gorgeous kitties that came for breakfast snuggles every morning, it was a lovely destination to come home to and relax in after a day of shooting. Miss Victory Violet is an absolute storm in the kitchen FYI – I don’t think I’ve ever eaten so well in my life! It was also brilliant to spend a little more time getting to know Miss Victory Violet’s husband Matt better, as he was travelling with us too. The vintage boudoir makeover shoots took place at Foxy Vixen’s Beauty Parlour, run by the lovely Joy. Every room in her parlour is incredible, from the styling room where Miss Victory Violet worked her magic, all the way down into the lower ground floor where there’s ever a motor themed garage full of vintage treasures! Whilst we made use of all the rooms throughout the two days – including a beautiful green chaise in the living room – the snug downstairs was by far the most popular room. I also managed to squeeze in a private boudoir shoot with burlesque performer and pin up model Wilhelmina Af Fera whilst we were there! 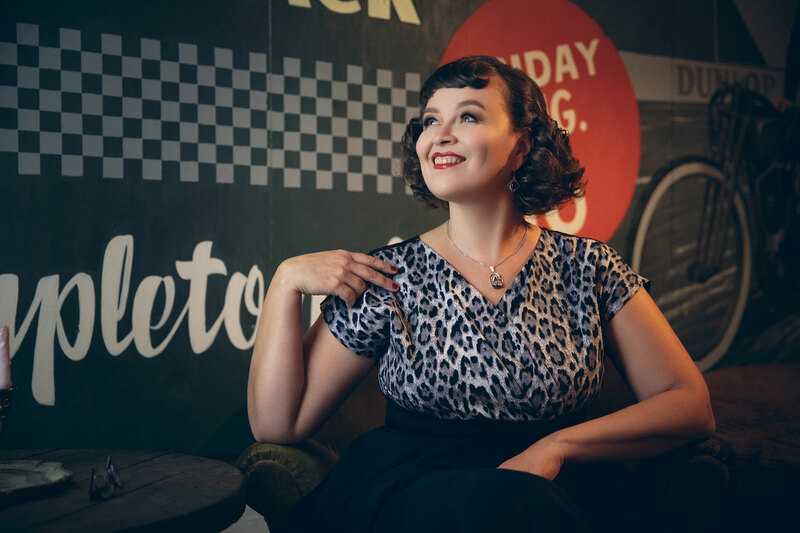 Whilst all of our Vintage Pinup Makeover shoots are for your eyes only, we feel privileged that so many of our clients give us permission to share their images with you through our blogs. Here’s a selection of images from our Helsinki shoot days. A massive thank you to all of our incredible clients who joined us in Helsinki and to Foxy Vixen’s for making us feel at home every time we visit. Want Miss Victory Violet and I to bring our Vintage Pinup Makeover Shoots to your country? Register your interest here. Inspired? Book your own boudoir shoot with me today – check out my boudoir photography packages here and then drop me an email with your preferred date. I can’t wait to hear from you!